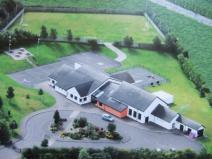 Blessed Patrick O’Loughran Primary School is situated in a pleasant and attractive rural setting on the outskirts of Castlecaulfield village. 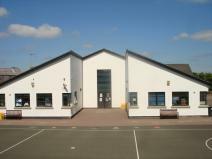 The school building was opened in April 2002 and provides a modern, well resourced, bright, spacious and comfortable accommodation. 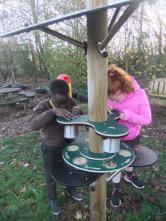 The school has toilet facilities for disabled children and is designed for wheelchair access. 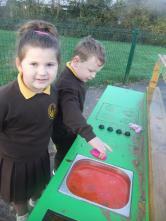 The Key stage 1 and 2 children have access to a tarmacadam play area and a grass area. 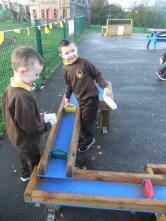 A Foundation Stage play area has been added and provides a safe area that is conducive to active learning. A sand based pitch adjacent to the playground was officially opened in June 2006. This pitch is utilised by the whole community outside school hours. 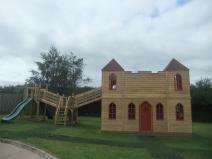 A castle play structure and Sensory Garden have both enhanced the school grounds and the learning experience of our pupils. These areas were further developed in 2018 with active learning equipment. The current staffing consists of a teaching principal, 4 teachers and 5 classroom assistants. A part time tin whistle teacher provides tuition for Years 3 through to 7. The teachers, ancillary and auxiliary staff comprises a team dedicated to the education and welfare of the children. 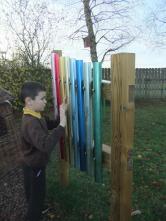 Together they provide a range of experiences and expertise across all areas of the primary school curriculum. Blessed Patrick O’Loughran P.S. aims to provide a rich and varied curriculum to promote the spiritual, physical, intellectual, emotional and social development of each child in a pleasant, happy, caring and sharing environment. Emphasis is placed on developing competence in the basic skills as well as confidence, self-esteem and consideration of others. A high standard of work, conduct and attendance is evident from all pupils. Our school uniform of brown and gold is worn with pride. Educational visits, Gaelic, Soccer, Hurling, Netball, Drama, Swimming and Dance are part of the curriculum and provide interaction with other schools. An annual Sports Day is held for all children as well as an annual Gaelic football tournament (Fr. Finnegan Cup) to which other schools are invited. Christmas music and drama productions are performed for parents and friends. The pupils participate in the local Feis and external quizzes and competitions. Blessed Patrick’s is a Health Promoting School and has links with the local controlled school, parish schools and the local Grammar school. We support designated charities every year. Parents are encouraged to play an active role in their children’s education. Parents are invited to a Year 1 Parent’s Evening in the first term. Parent/Teacher meetings are arranged for the first term at which parents can discuss their child’s progress with his/her teacher. A written school report is sent home in the summer term. A school newsletter is sent home monthly informing parents of school news. Our Parent Support Group is involved in raising funds and provides a social aspect to school life. Recent fundraising enabled the school to purchase a new school sports strip, ipads, playground equipment as well as supplementing the costs of school trips. The members of the Board of Governors are keenly interested in all aspects of the school and strongly support the work of the staff.